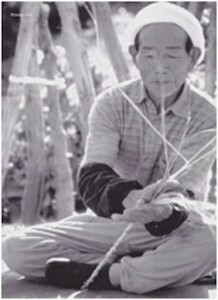 The above photograph must have been taken around 1983-4 at the family shrine in the small garden of the Yamamatsu home and Nishikigoi outlet in Mushigame village. 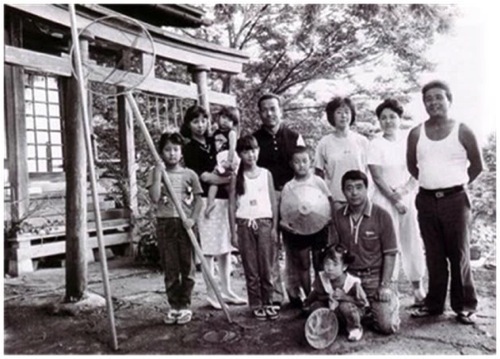 It shows Toshiyuki Sakai on the far right with his wife to his left and his son Toshiaki on the far left holding the Koi net. Toshio Sakai is in the back centre of the picture with his daughter Miwa and son Toshi in front of him, his wife is standing on his left holding a child. The lady next to Toshiyuki’s wife is his sister and the mother of Isao Nagashima who now works at Yamamatsu – she also owns a hairdresser’s shop in the village. Some years ago, Toshio told me that in his youth, nylon fishing line that’s commonly used today to string the mud ponds against birds was far too costly to buy. Most breeders back then used straw plaited together by rolling but it was a very laborious task. Their father offered Toshio and Toshiyuki payment per meter for this and it was the only chance of income as the father refused to give any free pocket money! Every moment of their spare time was spent in producing these ropes and their father would inspect it severely before handing over the money. The payment itself was a pittance, he did tell me the amount but it’s hard to convert. Let’s just say that 25 meters of the rope would buy one small bar of chocolate. Trouble was, there were no shops in Yamakoshi, but that didn’t stop the two brothers who would race each other to Nagaoka and back after spending and eating all their wages! This was a 17-mile return journey mostly over mountains and across rice paddies! This entry was posted in The Koi. Bookmark the permalink.